On Saturday last the Erin’s Own Under 12 boys travelled to Palmerstown to take part in the annual Dicksboro Under 12 Denis Molloy Cup. With eight teams participating the Comer boys were drawn in a group with James Stephens, Dunamaggin and Ballyboden St. Endas from Dublin. The Comer boys took on James Stephens in their first game and with some lovely combined play and strong forceful hurling from Declan Buggy, Dan Coogan, Cathal Holland and James Brennan the Comer boys ran out winners by nine points. A feature of this game also was the excellent free taking of Cathal Holland. Kevin Holland went great in the first game until a bad injury put a premature end to his days hurling. Next up was Dunamaggin and in a brilliant game of hurling Erin’s Own had to call on all their reserves to run out winners by four points. In this game the Comer boys made great use of the ball and to the fore was Nicky Connolly in goals who made two great saves, Liam Holland, James Buggy who set up the all important score for James Brennan with a lovely touch and Jack Buggy who scored two points from line balls. Comer took on Ballyboden in their last game and after a very tight first half the local boys pushed on and ran out easy winners to qualify from their group. Kevin Brennan scored some lovely goals and points in this match and the consistently strong Conor McMahon who never put a foot wrong all day long was also to the fore. Christopher Kruff worked his socks off all day as did Lee Holden, Kealan Ring, Billy O Neill, Killian Hogan and David Ferris who has shown great improvement in his first year of hurling. conditions the Comer boys set out their stall from the start with some great hurling all over the field. Coming to the break the Comer boys were behind by three points. The second half belonged to both defences and as the efforts of the days hurling starting to tell on the young boys it was the Thomastown boys who ran out deservedly winners by four points. Regarded as one of the big days in Kilkenny Juvenile hurling the Dicksboro club are to be complimented on the running of a great days hurling for all boys under 12.Â Well done to the local boys on ending up in the Tournament final. The panel for the tournament was Nicky Connolly, Declan Buggy, Kevin Holland, Dan Coogan, Conor McMahon, Jack Buggy, Cathal Holland, Christopher Kruff, Kevin Brennan, Lee Holden, James Buggy, James Brennan, Billy O’Neill, David Ferris, Kealan Ring, Killian Hogan, Liam Holland. Countdown to All Ireland. The town and approach roads are really starting to warm up to the replay of theÂ All Ireland Final with plenty of colour on show. All in Erin’s Own wish the best of luck to senior panellist Conor Fogarty as he chases a second Senior All Ireland medal and to his father Martin who is of course a selector with the team. Best of luck lads. Club Lotto. The club lotto is now up to €15,950.00 Be in to win. Get your tickets from any committee members or from local shops. You can also sign up to a direct debit scheme whereby you are entered every week in the Local lotto so you don’t have to worry about getting your ticket. Contact Helen at 087 6645022 or any committee member if you would like to take up this way to play the local lotto. Remeber all the money raised goes back into your community. Ballyragget was the venue for this Northern Junior semi-final clash between Lisdowney and Erins Own. Lisdowney came out on top in a game that was hard fought all the way through, with slippery conditions not impacting the quality on show. Lisdowney started the brighter of the two sides, minor Kevin Sweeney opening the scoring inside the opening minute. 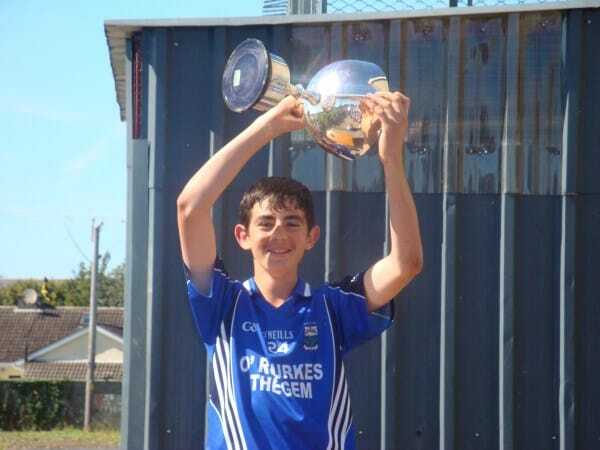 17 year old Michael Kenny added another for Lisdowney before Eddie Brennan replied with Comers first score. Andrew Carron used his lightning pace to level the sides with Aaron Fogarty restoring Lisdowneys advantage a minute later from a well struck free. Dermot Wallace pointed for Comer before Eddie Brennan and Paddy Bowden traded scores to leave the sides level for the third time. Ciaran McDermott and Michael Kenny traded scores before four successive scores from Lisdowney left them four points ahead after 25 minutes.Eddie Brennan struck over a free for the Comer side but Lisdowney replied sharply, the clinical Eddie Hickey pouncing on a mistake in the Comer defence to finish the ball into left side of the net. Eddie Brennan shot over two more placed balls before the break to leave Comer trailing at half time by 1-9 to 8 points. Lisdowney had played with the breeze in the first half and deserved their lead at the break. Their forwards had looked sharp in the drizzle that had descended on Ballyragget. Eddie Brennan had kept Comer in touch however and they started the second half much brighter than the first, Brennan pointing straight away. Vincent Fitzpatrick pointed for Lisdowney before a goal by Eoghan Mealey put just a single point between the sides. Fitzpatrick and Brennan traded scores before Sweeney shot over from a placed ball. Two well taken Brennan frees levelled the scores for the first time since the 16th minute, but Comer couldn’t capitalise on their new found momentum and Lisdowney outscored them 5 points to 1 in the closing ten minutes leaving them four points clear at the final whistle. A spirited performance from Comers second team wasnât enough to beat this Lisdowney side, who are one of the favourites to be playing in the Intermediate grade come April. Free taking from Eddie Brennan and Kevin Sweeney throughout was exceptional considering the conditions. Lisdowney will be confident of victory when they challenge for the title next week. Lisdowney: Niall Grogan, Niall Mackey, Martin Phelan, Paraic Kenny, Niall Kenny, Shane Clyne, Peter Bergin, Mark Carroll, Aaron Fogarty, Vincent Fitzpatrick, Kevin Sweeney, Eddie Hickey, Paddy Bowden. Erins Own: Jim Buggy, Noel Callinan, Damien Mullins, Ciaran Wallace, Sean McDermott, Jimmy Byrne, Liam Wallace, Ciaran McDermott, Eoghan Meally, Declan Dunne, Eddie Brennan, Andrew Carron, Ciaran Brennan, Dermot Wallace, Anthony Kavanagh. Subs: Darragh Brennan, Stephen Daly. Erin’s Own U-12’s followed up on their recent Callan Tournament victory with another win in the Andy Egan Tournament final. In a series of top class matches Comer started off the day with a draw aginst Dicksboro. They needed to beat Naas by more than 11 points to make it to the final and duly delivered by delivering a masterclass with a 17 point victory. They faced Thomastown in the final and what a game it turned out to be. Comer piled on the pressure in the first half and but for 3 top class saves from the Thomastown keeper Comer would have been well on the way. A James Brennan goal and 4 Cathal Holland frees was the Comer half time total. The Comer boys were 2 points clear at the half time whistle. Scores were hard to come by in the second half with both defences on top until James Buggy knocked over a great point from the left wing. Thomastown recovered and scored their second goal to level the scoreboard and this proved to be their last score. 2 more 65’s and a free from Cathal Holland was the difference in the end for Comer to win by 1-8 to Thomastown 2-2. It was an excellent all round team performance by all 18 players at various stages throughout the day. James Brennan accepted the Cup on behalf of the team as first time winners of the Andy Egan Tournament.